Annnd here is week five! Can you believe? We are now in Week SIX of 2013. DANG. I actually put Week 4 in the title. And then realized... I'm a week off. This one should be Week 5, and the last one Week 4. I did Week 3 twice. Gah! So confusing! Haha. Well, time flies when you're having fun! Or when you're not...so, that's always good. ANYWAY. 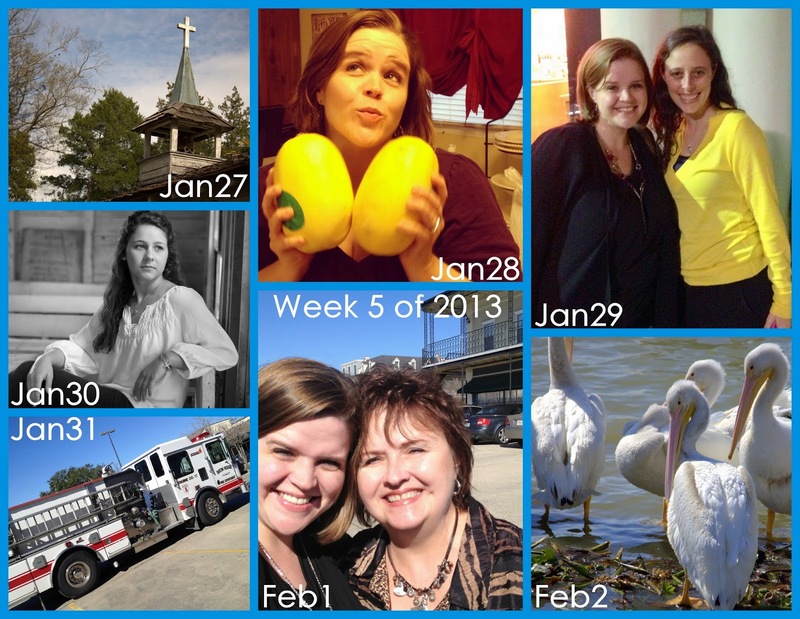 Here's my week 4... er, FIVE... collage. And i am so sorry that i haven't been writing ACTUAL posts with paragraphs & topics & such. I'll get on that someday! Wed, Jan 30: I didn't take a pic this day because i was too busy editing pictures for our photography class homework! Ha! This is one of the edits. Will show it to you in another post soon. It's one of my favorites, but has lost something in this small collage version! Thurs, Jan 31: I called the fire department today!! Haha! A little smoke at a cosmetology school never hurt anyone. Ha! Really it was nothing... but we thought it could be...and you don't want to take chances! (We being them - they stuck their head in my door and said "call the fire dept. right now." and so i did. I really didn't know what was going on but the person telling me to do it can be trusted! Haha.) Anyway...that was about as exciting as it got! Fri, Feb 1: Lunch with my mommy! Missed her so!